Yesterday I posted a story and video of Russian Base Jumper Valery Rozov, who had reportedly set a new world record for the highest jump ever. Turns out that wasn't exactly true and Rozov's sponsor, Redbull, has quickly corrected their error. The story that was widely being reported yesterday was that Rozov and a couple of climbing partners spent six days summiting Mt. Shivling in India. 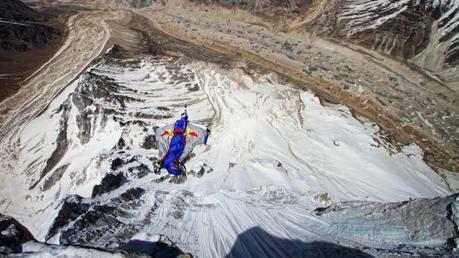 When they reached the top, Rozov used a wingsuit to descend from the 6543 meter (21,466 ft) peak. In the initial press releases that were sent out, that was hailed as new altitude record. But according to this story from CNN, the actual record is held by Glenn Singleman and Heather Swan. That husband and wife team made a jump from the summit of Mt. Meru, also located in India, which is 6604 meters (21,666 ft) in height. As you can imagine, Singleman and Swan were a bit "miffed" when they heard the news, especially since it was covered by a number of news outlets. To Redbull's credit however, as soon as the error came to light, they changed their statement to read the jump was Rozov's highest ever and that it was another great addition to his already accomplished career. Rozov simply said that he didn't really care about records at all. Thanks to Chris for sharing the CNN link.